Dan Bazzani has been a leader all of his life, and his successful exploits in local high school and college athletics are a tribute to his love of Western New York and the people who live here. He was a three-sport star at Niagara Falls High School where he was captain, top scorer and all-Niagara Frontier League in basketball and all-league as a quarterback for the Power Cats. His exploits eventually earned him a spot in the school’s hall of fame. Dan went on to captain the University at Buffalo basketball team, where he played from 1962-65. During that time, the Bulls went 49-18 (.731) and Dan averaged 7.1-points per game. He was team captain of the 1964-65 quintet that went 19-3 and rates among the finest squads ever to represent the Bulls on the hardcourt. Finished with his playing career, the ambitious Bazzani took a liking to the sidelines where he took the reins of the basketball program at Niagara County Community College. In 10 seasons he compiled an amazing record of 197-68 (.743) including a 26-1 mark in 1977, finishing second-ranked in the National Junior College Athletic Association poll. Parlaying his success at NCCC, Dan moved back to his alma mater where he took over the Bulls in 1983. In 10 years, he compiled six winning seasons and currently ranks fifth in all-time wins with 111. More importantly, he led UB into the NCAA Division I era where it currently resides. Completing the circle, Bazzani became the first head coach of the consolidated Niagara Falls High School in 2000. Making sure he upheld the tradition of quality basketball in the Cataract City, Dan’s teams went 144-12 (.923) in six years, won a couple of state titles and ranked as high as first nationally in 2005. 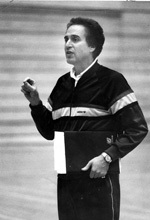 USA Today named him its National High School Coach of the Year in 2005. Dan continues to impact the lives of young people as he currently serves as the athletic director at Niagara Falls High School.